The British Army’s brutal battles in France in 1940, and its subsequent evacuation from continental Europe via Dunkirk, cost the army much of its heavy equipment. In the summer of 1940, the British military needed new armored vehicles — and fast. Enter the Armadillo. The British envisioned the Armadillo as an expedient response to a very real threat. Germany’s invasion of France had proved that airfields were extremely vulnerable to attack by paratroopers, who would aim to capture airfields intact. To prevent this happening in Great Britain, the Royal Air Force settled on the idea of highly-mobile defensive vehicles. The simply, modestly-armed vehicles would deploy quickly to battle lightly-armed German paratroops attacking from above. In the summer of 1940 the RAF decided the best way to speedily produce the defensive vehicles was to convert commercial trucks. Just add a “bastion” — a kind of armored box — plus several Lewis Guns and riflemen. Each Armadillo truck carried a crew of five. The bastion on the back of the Armadillo was made out of two layers of three-inch thick wooden planks with six inches gravel between each layer. This offered fair protection from the type of small arms typically carried by paratroops. Only the engine and driver’s compartment were protected by steel plates. This approach minimized the consumption of armor plate, which was in high demand for other urgent projects. The Armadillo’s design suffered at least one serious drawback. The bastion featured an open top, making it vulnerable to grenades and aerial attack. However, as the Armadillo was a mobile fighting platform and not a stationary pillbox, it could fight and scoot, thus minimizing its exposure to concentrated attack. That was the theory, at least. The concept of operations was simple. Armadillos waited under camouflage in airfield outbuildings. They would deploy only when an airfield came under attack. As it turned out, Germany didn’t invade the British Isles, and the Armadillos never really got to serve their main purpose. The British produced several versions of the Armadillo between 1940 and 1942. The Mk. I Armadillos were requisitioned civilian commercial trucks with hastily-added bastions and protected cabs. The Mk. II was newly-built directly onto a Bedford truck chassis, while the Mk. 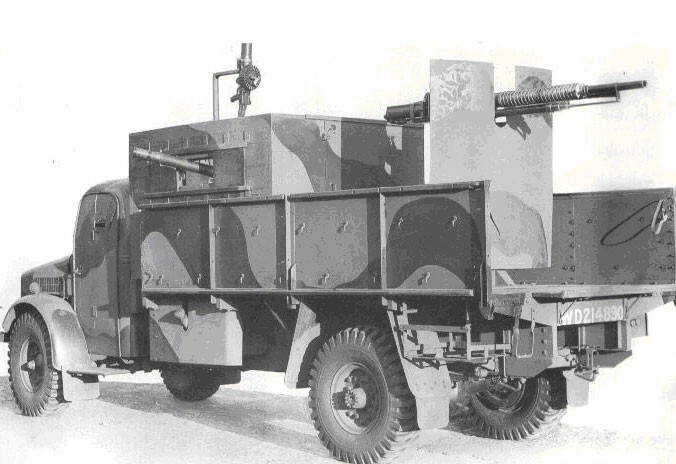 III added a clip-fed semi-automatic 37-millimeter Coventry Ordnance Works Gun at the rear of the truck’s bed, significantly increasing the Armadillo’s armament. In all, the British produced 877 Armadillo armored fighting vehicles between 1940 and 1942. Once Britain’s strategic situation had improved somewhat, new armored cars replaced the Armadillos. The surplus vehicles passed to the Home Guard or were refurbished for other uses.